Fife’s unified rugby clan is celebrating thanks to a cash donation from a regional builder which will be used to deliver a youth training course. Fife Clan Unified Rugby has become the latest group to be given an £800 cash injection by Persimmon Homes North Scotland as part of its Community Champions initiative to support local team, charities and individuals. The Clan has partnered with local mental health charities in Cupar and the nationally recognised School of Hard Knocks, an organisation that combines sport and life lessons to help individuals struggling with isolation and social issues. The concept of unified rugby brings together players who suffer from learning disabilities to compete alongside non-impaired counterparts. 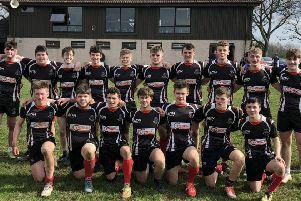 Karen Mitchell, fundraiser at Fife Clan Unified Rugby, said: “We are delighted to be chosen to receive this generous donation and we can’t thank Persimmon enough for its support. “The money will help us to deliver a rugby training course that will help the young people involved to develop social skills and interaction with others as well as supporting their positive mental health. “We applied for the match funding from Persimmon after receiving £800 from Fife Council. Together the money will enable us to set up weekly training sessions with transport and a social meal included. “The School of Hard Knocks has a proven track record in the delivery of similar sporting programmes and we hope to eventually roll out our version of the training methods in conjunction with mental health services. Iain Innes, managing director for Persimmon Homes North Scotland, said: “It gives us great pleasure to support Fife Clan Unified Rugby. “We have a four current developments in and around Fife and our Community Champions initiative is just another way for us to give back to the communities in which we are building. The Community Champions is a national programme where charities and groups can apply for funding up to the value of £1,000 to match money they have already raised themselves.